Our 100% Pure & Raw Cranberry Honey is sourced from cranberry bogs from one of our favorite apiaries in northern Wisconsin. This rare honey is pleasantly sweet, with a strong fruity flavor, light nutty taste, and very mild tart finish. Cranberry honey is a great source of natural antioxidants just like the cranberries themselves! You're sure to be delighted with the flavor and health benefits our Raw Cranberry honey has to offer. Working with several family owned apiaries throughout the United States as brought us in contact with some amazing honeys! All of our honey hand picked from our suppliers to ensure it is pure, delicious, and RAW! Our Raw honey is not the standard, store bought honey that most are used too. Under United States law, in order to call a honey "Pure" it must contain at least 51% real honey. The remainder can be supplemented with filler syrup. This is the case with more commercial store bought honeys. Our Raw honey however, is 100% Pure Honey with no additives. We offer a couple types of honey with different flavors. Yes !.... honey flavors do differ. 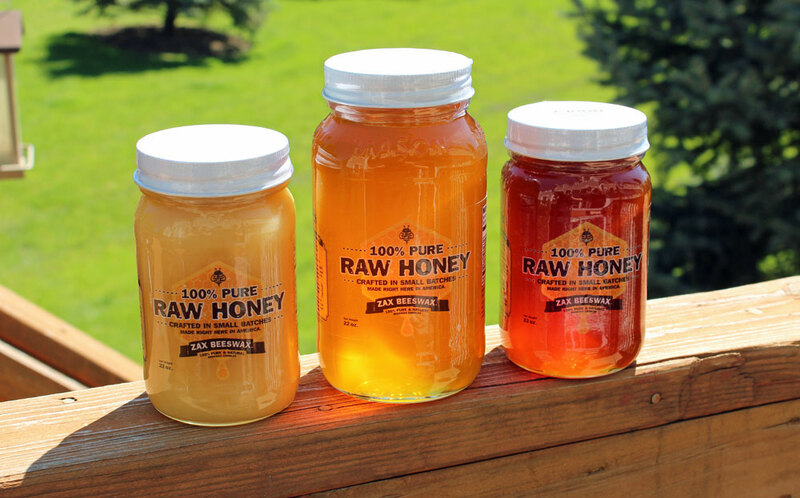 The technical definition of raw honey is very loose: it means not heated past pasteurization. To understand that, it’s important to first understand what happens inside the hive. When honeybees are at work, their collective body temperature rises and consequently warms their work area – that is, the honey. The temperature of an active hive, therefore, is about 95ºF (35ºC), and the honey is stable and “alive” – or rather, the enzymes in honey that give it the nutritional and beneficial qualities are alive. As long as the temperature of honey does not significantly rise past 95ºF/35ºC, the honey has not been pasteurized. Many people misunderstand the concept of heating honey. There’s a myth that any heating whatsoever is harmful. But even the bees heat honey. During the winter months, the bees will heat the honey with their bodies in order to eat it and survive. During the summer, the bees do not need to heat the honey but the general temperature is about 95 degrees. As long as honey is heated gradually, then you don't loose the "good stuff" as we call it. Heating it rapidly is called flash-heating. This sudden heat destroys the enzymes and chemically changes the honey. It’s still sweet, but it’s now chemically more like a processed sweetener and may even taste different. Even without any noticeable changes, the honey has lost all its nutritional value (and is no longer raw). Many people prefer crystallized honey as its a sign of purity and quality. After all, Crystallization of honey is a natural and uncontrollable process. Over time, almost all pure raw honey crystallizes. Crystallization of honey is a little understood process and a much misunderstood phenomenon. Honey contains more than 70% sugars and less than 20% water and is naturally an unstable super-saturated sugar solution. The composition ratio of glucose and fructose in a floral nectar source determines how fast the honey crystallizes. Honey varietals with a low fructose to glucose ratio, such as floral varietals Dandelion, Aster, Clover, and Alfalfa honey crystallize swiftly in days and weeks. During crystallization, glucose sugar which are naturally pure white, separates from water and become crystals, while fructose remains as a liquid. That is why crystallized honey thickens, becomes more viscous and sets a lighter color than when liquid. Some honeys crystallize uniformly while others crystallize partially at the bottom of the jar and form a layer of liquid on top. See image on the right. Also, the size of the crystals formed varies from honey to honey; some varietals crystallize rapidly to form fine crystals while others, slowly to form large ones. (This is the reason why some honey varietals crystallize to form a coarse sugary texture, and some varietals crystallize to form a smooth creamy consistency.) The formation of crystals has absolutely no bearing on the quality of honey or its taste. 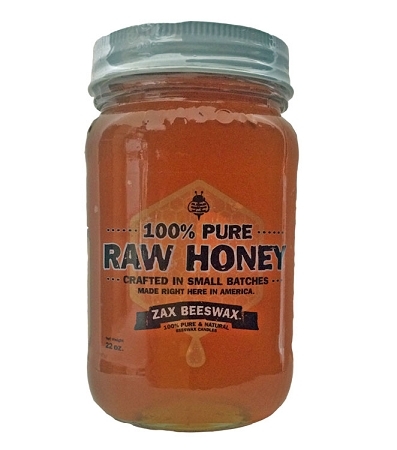 Whats the difference between Zax Beeswax Raw and store bought commercial honey? So many flavors within this honey. It's good. This honey is so tasty good. Love the smoothness and the flavor is fantastic! I drizzle it on toast, muffins, use in my coffee and tea and on oatmeal! It's the very best quality too!